NYC Recession Diary: LOMBARDI: Two Free Lombardi Broadway Tickets from 1iota - act now! LOMBARDI: Two Free Lombardi Broadway Tickets from 1iota - act now! 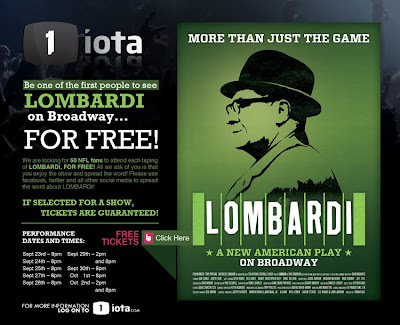 Attention all - act now to get two legit free tickets to see LOMBARDI on Broadway from 1iota! I just confirmed my two free Broadway tickets to next Tuesday, Sept 28 so this is really exciting. If 1iota confirms your tickets, you are guaranteed! The available performances are for Sept 23 - Oct 2. The tickets are regularly $115 - so I just got $230 worth of entertainment for $0. If you can't get confirmed free tickets from 1iota, get really discounted tickets by clicking here ($49-$79). Click here to register with 1iota and get your free Lombardi Broadway tickets. I got mine too! Thanks so much Katharine!